Surable oil spaced lens - Why an oil-spaced triplet-lens? 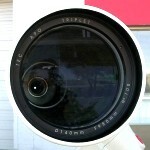 This Reducer/Corrector reduces the focal length of the 180 FL from 1.260 mm to 900 mm and gives you a focal ratio of f/5. For a full frame camera (24 x 36 mm), this results in a field of view of 1.5 x 2.3 degree at an image circle of 50 mm, diffraction limited and free of vignetting.